Chicken is a lean animal protein, lower in fat and calories than red meat or pork. Roasting your chicken allows excess fat to drip away from the meat, and the American Heart Association recommends it as a cooking method for lower cholesterol and heart health. You can add flavor to your roast chicken with fresh herbs or spices, but do not baste the chicken with its own drippings, which adds the fat back to the meat. Roast chicken contains protein and some fat but no carbohydrates. Four ounces of breast meat chicken has 184 calories, 1 gram of fat and 36 grams of protein. An equivalent serving of thigh meat has 228 calories, 12 grams of fat -- including 4 grams of saturated fat -- and 32 grams of protein. The amount of protein you need is based on the number of calories you consume daily and individual health concerns. The 2010 Dietary Guidelines for Americans suggest between 10 and 35 percent of your calories come from protein. Following a 2,000-calorie diet, this means you should consume between 50 and 175 grams of protein. Dark meat roasted chicken has more fat than white meat, but you can reduce the fat content of both types of meat by removing the skin. If you eat four ounces of chicken, leaving the skin of adds 60 calories and 4 grams of fat. For a chicken breast, this boost its calorie and fat content to 244 calories and 8 grams of fat. The American Heart Association recommends removing the skin from roasted chicken before eating, but does note that leaving the skin on during the cooking process may help keep the meat moist. Chicken is not a good source of most vitamins, except niacin, or of minerals, except selenium and phosphorus. One ounce of chicken has 19 percent of the recommended dietary allowance of niacin, 11 percent of the RDA of selenium and 6 percent of the RDA of phosphorus. There are trace amounts of other B vitamins -- niacin is also known as B-3 -- and small amounts of B-6, B-9 and B-12. Safe handling of raw meat is critical to avoid serious illness caused by bacteria that can thrive on chicken. Bacteria in chicken can only be killed by cooking -- not by rinsing or soaking. The USDA Food Safety and Inspection Service advises against rinsing raw chicken, which can spread bacteria to other areas in your kitchen -- called cross-contamination. 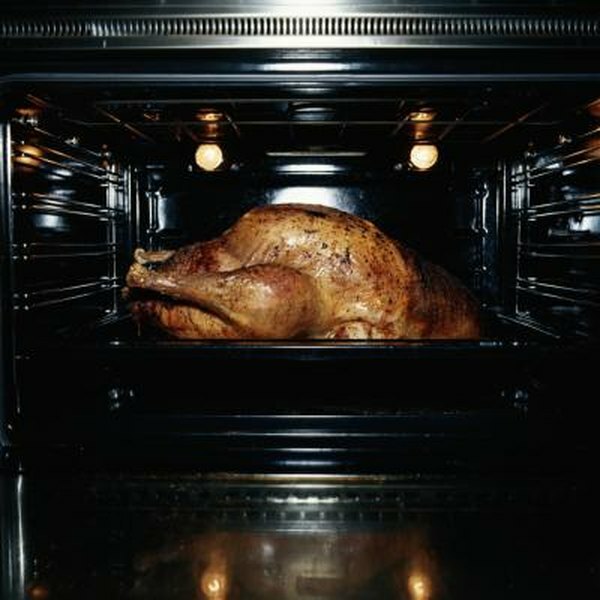 To ensure that you have destroyed any pathogens, test the internal temperature of your roast chicken in several places -- breast, thigh and drumstick -- and look for an internal temperature of 165 Fahrenheit.